We here at Things in Light love poetry. And New Mexico's literary landscape is steeped in the stuff. In celebration of National Poetry Month, TiL will present poetry by members of the exciting and diverse contemporary New Mexico poetry community. 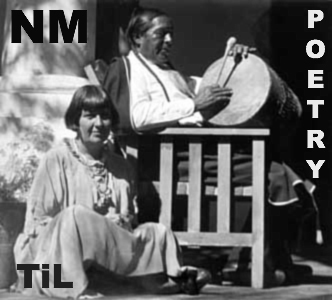 The fifth TiL NM Poetry entry provides a two-poem introduction to the work of Albuquerque native and UNM Poetry MFA student Bonnie Arning. as you once belonged to me. one hundred times your size. Congratulations! blood. Doctor why am I bleeding? I'm sorry but it looks like the fetus has been aborted. Aborted? Not Abortion—how much I want you. or my blood? Which of us is wounded? in chalk—after all, my daughter has died here. don't worry, it was a blessing in disguise. Congratulations! You have dodged the baby-bullet. your body didn't resemble a chewed hunk of liver. the need to make some proof you were alive. Bonnie Arning is an Albuquerque native who is currently pursuing her MFA in poetry at UNM. She is the current poetry editor of the Blue Mesa Review and has work that has appeared or is forthcoming in Cream City Review, Gargoyle Magazine, and 2River View.